The Spork, or combination spoon/fork/knife is an attempt to reduce the number of cooking utensils as well as the weight you carry so for ultra-lighters you can’t really beat this option at only nine grams. I must admit I’m a bit ‘old school’ so am not a big fan of the Spork concept just as I didn’t like the idea ‘Splades’ (if you don’t know what a Splade is ask your parents…. or grandparents). My cutlery utensil of choice for hiking is still a long handled spoon. So keep this in mind as you read this review. If you are eating meals out of bowls or off plates then this Spork works well. For those of us who eat of out bags or peanut butter jars then not so much. 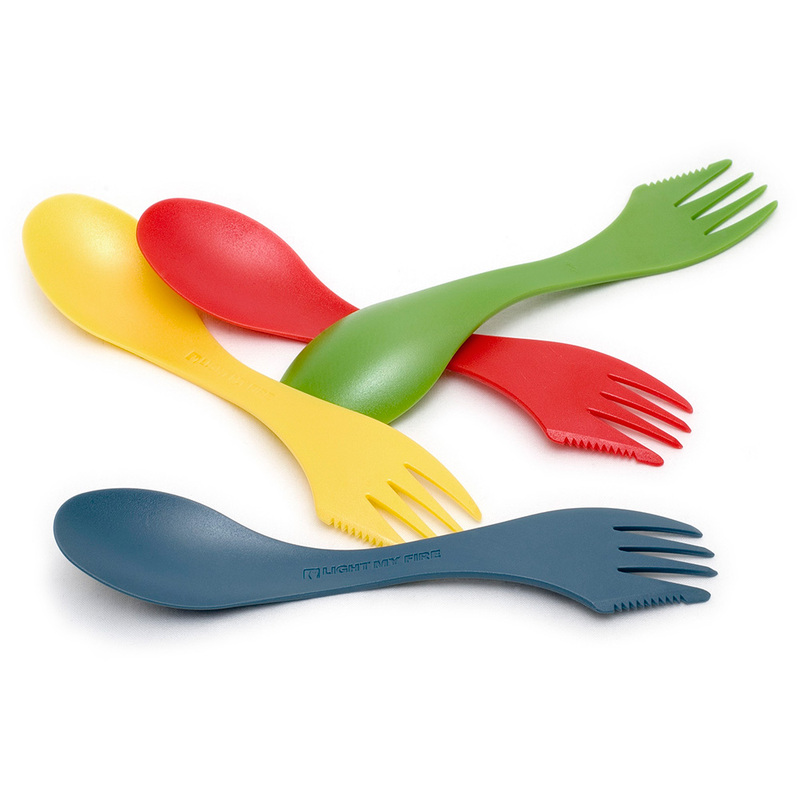 Apart from the lightweight and low purchase price, the uses for the Spork are limited. As a double ended implement that has a spoon on one end and the knife/fork on the other I don’t find it comfortable to use as I have large hands. I find that I’m holding either a fork end or a spoon and in my hand so have to be really careful if I’m using both ends for a meal or I’ll spread food everywhere. As a counter to my thoughts Gill, whose hands are much smaller than mine, finds this Spork more comfortable but still felt that the handle in the middle should be longer. The lightweight material is heat resistant but this really only applies to hot meals and soups not for using with cast iron pans over an open fire. In addition the length of this Spork means that if you are cooking with this Spork then you are very close to the hot end of the cooking process. The knife component that forms one edge of the fork tines is not particularly robust and is really only useful with bread or breaking up cooked soft food; not for cutting meat. If you don’t mind the Spork concept and want to go as lightweight as possible then the Light My Fire Original Spork is a good starting point. At under $4.00 AUD it isn’t going to break the bank if you want to give it a try.